Want to know a juicy secret…? Home•Food, Kawai Purapura, Yogic Lifestyle•Want to know a juicy secret…? Want to know the juicy secret to feeling instantly more vibrant, energetic and healthy? It’s easier than you think! All you need to do is treat your body to a spring clean. With our 5 Day Juice Detox you’ll notice immediate results and in just a few days you’ll be glowing from the inside out, you’ll have more energy, sleep better and think clearer. 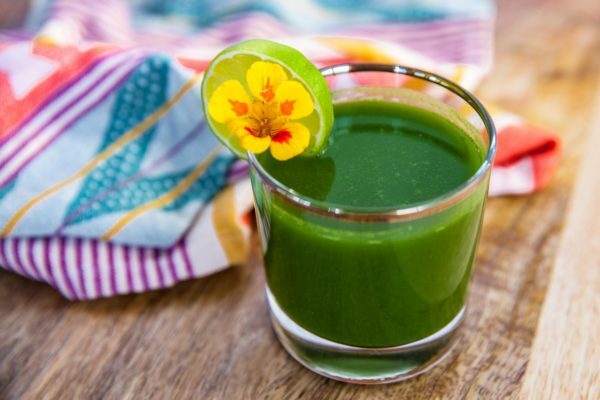 Give it a go yourself with this super tasty ‘go-green’ juice recipe. If you like it then come and join us for our juice retreat and learn all the knowledge and science behind why this fast is so beneficial and how to implement it into your day to day life. ¼ tsp ground turmeric, or 1cm piece of turmeric. Put the ingredients through a juicer or into a blender. Studies show that drinking juice on an empty stomach is the most beneficial time as this is when vitamins and minerals are best absorbed. The ingredients chosen in this recipe are intended to cleanse your body and mind. Kale – Kale is a cruciferous vegetable, part of the Brassicaceae family. Kale has been shown to influence liver enzymes which help the body to detoxify. It is very rich in lutein, which improves general eye health. Apple – Apples are a nutritional powerhouse. Rich in vitamins, minerals, and antioxidants they contain quercetin, an antioxidant with anti-inflammatory properties. Apples also contain pectin, which helps clean blood vessels. Cucumber – Cucumbers are an excellent source of Vitamin K and molybdenum and have been shown to have antioxidant and anti-inflammatory properties. Ginger – Ginger aids digestion and has numerous therapeutic properties. Ginger contains compounds that boost the immune system and is often used to help relax and sooth the intestinal tract. Turmeric – Turmeric contains compounds with medicinal properties, among these compounds is curcumin. Curcumin has very powerful anti-inflammatory effects and studies have shown that it helps regulate blood sugar levels. Send us a photo of your juice or share your favourite juice recipe with us.